We start our November series on Virtual Book Tours, with an absolutely brilliant post from Camy Tang, that covers all aspects of virtual book tours. I had originally intended to write my own post on virtual book tours but whilst doing the research Camy suggested that I looked at her post on organising a blog tour. Her post is so good that I dropped the idea of writing one and asked her instead if we could use hers on the blog, thankfully she agreed. 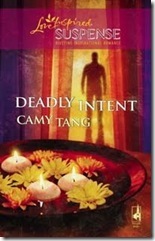 Earlier this year Camy ran her Deadly Intent Blog Tour which ran for nearly two months, had an astounding number of venues and is notable in the diversity of methods and content that Camy used to promote her book. So far this year, the Deadly Intent blog tour, has set ‘The Standard’ for others to follow. So we are very pleased to have her share her knowledge on these pages. From Robin Caroll’s blog: What was your inspiration for Sushi for One? I promise it wasn’t my family! My grandma (and my parents, and my other relatives) are nothing like Grandma Sakai. GS was a conglomeration of stories I heard from friends about their parents/aunties/siblings/grandparents. Of course, once I had Grandma Sakai, what better than to pit her against Christian single women in her family with as much backbone as she has? From Amber Miller’s blog: What gave you the inspiration for this book? Then I applied Donald Maass’ WRITING THE BREAKOUT NOVEL WORKBOOK and asked, “How can I make things worse?” I’m so evil. From Erica Vetsch’s blog: Can you tell us a little about how the story went from idea to published novel? In general, Monday through Friday are the best days to post, with lower traffic over the weekends. If someone chooses to post over the weekend, you can request that they keep the post up over Monday so that you get maximum exposure. However, if they choose not to, don’t get upset. Remember, it’s their blog and they’re doing you a favor. 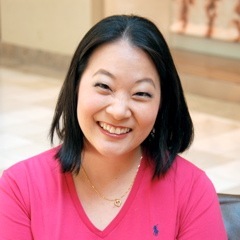 My name is Camy Tang, and I write Christian romance and romantic suspense with Asian American characters. If you like humor and romance, my chick lit Sushi Series is out now! Blog tours are a fantastic way of getting your book/s ‘out there.’ I am currently on my first blog tour with Wow Women on Writing. 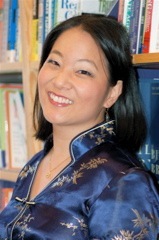 http://www.wow-womenonwriting.com. The whole tour was organized well in advance; I sent out books to review posts, and my blog hosts emailed me their requests for posts or interview questions. All the posts are to do with writing for children, my area, but all were different, and in some cases challenging. It has been a wonderful way of promoting my book, myself, and my skills. Many sites allow you to share on social media sites, or else the host does this for you. Fiona I would like to wish you the very best of luck with the tour and if you would like to keep notes and write a post about your blog tour adventures and mis-adventures, I would be pleased to post it as part of this series. Thanks for reposting my article! I hope it helps other writers!